Published in 1983, the “White Gold Weilder” formed the third and final part of the second chronicles of Thomas Covenant, the series portraying his adventures in the Land with Linden Avery. 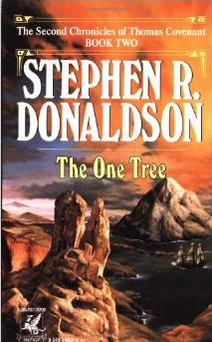 When we left them at the end of second book, “The One Tree“, it appeared that everything was lost. The only plausible solution to end the Land’s plight of Sunbane was to re-form the Staff of Law, but Covenant failed to do that. They lost some of their friends, Covenant’s ability to control his power and their Hope. There is nothing left for them to do on the island of the One Tree and so they decide to go back to the Land. But, their perils are far from over, as the ship has to travel through the dangerous part of the ocean called the Soulbiter. The ship is thrown off-course and ends up in a prison of ice. Instead of waiting for the spring melt, Covenant and his friends including Linden, Vain, Findaill, Cail and the Giants start travelling on ice on foot. At the end of a journey full of surprises and dangers, they meet Sunder and Hollian, whom they left behind at the end of book one of these chronicles. They have no good news however to offer. The Clave appears to have become more bloodthirsty if that was possible and is now destroying entire villages to keep the Banefire going. Covenant decides to march towards Ravelstone with the handful of his supporters. The Clave has made the fortress of Ravelstone unbreakable. Covenant summons the sandgorgon of Bhrathair. The beast arrives and gets them through the first barrier. Once inside, they fight valiantly and destroy the Raver that is controlling the Clave, but with some terrible losses on their side including innocent citizens of Ravelstone. Here, finally Covenant learns to combine the magic of his white ring with the Banefire to annihilate the strange venom from his body. Although they have managed to wipe out the Clave, the Sunbane is still there. Covenant gives the charge of Ravelstone to the Haruchai and decides to take the option that he subconsciously has known to be his only option. He needs to confront Lord Foul and so he sets on the journey to Mount Thunder with Linden, Sunder, Hollian, Vain, Findaill and two Giants. They are attacked by ur-viles on the way and Hollian and her unborn child dies in the struggle leaving Sunder grief-stricken. They arrive to Andelain, the last protected place from Sunbane. The Caer-Caevaral of Andelain sacrifices his immortal life to bring Hollian back, but in doing so he breaks the Law of Life. Unprotected, Andelain starts to succumb to Sunbane. The only way now for Covenant is forward. Covenant meets Lord Foul, but instead of fighting him, he gives up his ring willingly as the Despiser had prophesied. Lord Foul kills Covenant and tries to use the wild magic to destroy the Arch of Time. But, he is blocked by the spirit of Covenant. Lord Foul fails to understand taht the Law of Life is broken and “Covenant is the white gold”, i.e., the magic is not only in the ring but the bearer. With each attack from Lord Foul, Covenant’s spirit becomes stronger. The struggle ends when the Despiser is vanished, drained of all his power. However, his death is not same as new life for the Land. But, Linden now knows what she needs to do. She finally takes the ring and uses the white magic to combine Vain and Findaill, the structural rigidity of the ur-Viles’ lore and the Earthpower of Elohim, to make the new Staff of Law. She ends the Sunbane and heals the Land. She entrusts the staff to Giants so they can take it back to Andelain and give it to Sunder and Hollian. Her job completed, it is time for her to go back. She arrives to the “real” world, where Covenant is dead. Her only solace remains in the fact that the Love they shared is still with her and so is the white gold ring……….